I want to ask about the health system. It is quite complicated. Can I enquire about the design reasons behind this complexity? Recently I have started playing Cataclysm: Dark Days Ahead (http://en.cataclysmdda.com/) and they have a comparatively simple health system: Human bodies are divided in 5 slots: head, torso, left arm, right arm, left leg & right leg. Each slot has a 0-5 value, 5 being completely healthy and 0 being completely pulped. Things get bad when a slot's value approaches 0. Damaged legs make people walk slower. Damaged arms lower dexterity and weapon accuracy. If they reach 0 they can't heal without a sling. There is also an independent "pain" indicator. A person suffering acute pain (even if his 5 slots are ok. He might be drugged, etc) performs worse in general. This system allows for meaningful decisions: with only one medikit, you must choose between healing your leg, to run faster, or an arm, for steadier shots. Or maybe just your head, to alleviate the pain indicator. There is a complementary clothing/armor system. So each piece of clothing has 3 stats: protection against damage, against cold, and encumberment. So you for example you have to decide between wearing hiking boots, (with little encumberance, high armor, but low temperature protection), and winter boots (very good against cold, but encumbering and not as good armor-wise). This ties to the previous example: if you have highly protective boots you might be inclined to heal your arms before your legs. I find that this approach, with several "shallow" but interconnected systems, provide complexity and emergence, while remaining easier to understand, than fewer, "deeper" systems. Are you sure you are not doing simulation for simulation sake? LordSeaworth wrote: Nice to see such great work with this engine. kikito wrote: I want to ask about the health system. It is quite complicated. Can I enquire about the design reasons behind this complexity? I see where you are coming from and of course a system like CDDA would fit perfectly. For me the main reason why I want to implement this system is: Fun! I just liked the idea and wanted to see if I can implement it in a way that provides good gameplay. If it doesn't work out I can still change it later down the road. Of course I have some actual thoughts about the system and how they'll tie into gameplay. For example in CDDA the death of your character means the end of the game, whereas in my game it just means you lose one of your team members. The latter can be further differentiated if you take XCOM:EW and Xenonauts as examples. The latter plays more like classic XCOM where it is common to sacrifice people or at least use them as cheap scouts, whereas losing a highly-skilled squad member can end your whole run in XCOM:EW (at least on ironman classic+ difficulty). I'm more of a fan of the chess-like gameplay of the modern XCOM (or the Silent Storm) games, where you actually want to keep your team as save as possible. My plan was to include long-lasting effects for your squad, like blindness, missing limbs and maybe even mental health issues. Instead of having a team of expendable people you'd build a squad of highly experienced folks who you really care about after some time. On the other hand I don't want it to become a gamestopper when one of your guys gets killed, hence why my base gameplay will be quite important for the balance of this health system. kikito wrote: Are you sure you are not doing simulation for simulation sake? Thanks for the offer though - I highly appreciate it! Just a small update. Due to work and real life stuff I didn't have too much time to code, but that should change in the next few days (vacation ). Not only does this mean that I can simulate different organs, which have different effects upon taking damage and being destroyed, but I can also manually determine which equipment slots a creature can have. This should come in handy when I add non-human creatures. Obviously a dog shouldn't be able to wield a gun, but by giving him a "maw" body node I could then attach a bite-attack to that node. But that's something for a later release. All in all update 0.4.0 should be ready in the next few weeks. Yeah this is the first rough draft, so it lacks a lot of polish and some actual features. The (currently empty) box at the bottom will be used to display the item's description and stats. I see, I'm sure it will be great... What is the Other tab intended for? 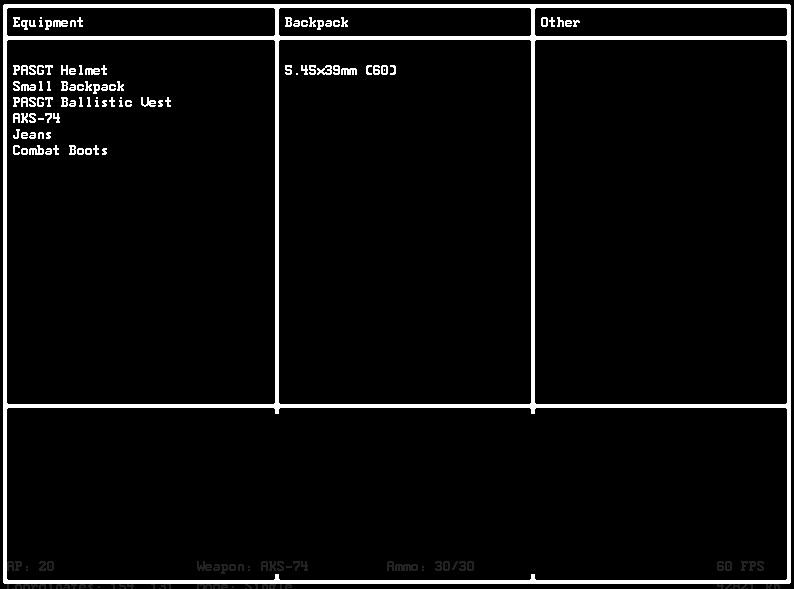 That's the inventory you are taking from, so for example another character's inventory, a chest or the floor. The "other" header will be replaced with the actual type of inventory later on. Please keep in mind that none of the features are final and a lot of the changes are just there to set the foundation for future updates. The basic setup for medical system is done now. Bodies can be created as graphs with nodes representing different body parts and edges representing the connection between them. This allows me to create different types of creatures in the future. and especially keeps the whole system pretty flexible. I specifically wanted to avoid hardcoded inventory slots based on the human body. Each body has socalled entry nodes which represent the body parts which can be hit by an attack directly. Each of these nodes can be damaged and ultimately being destroyed, which also leds to the desctruction to any connected child nodes. So if an arm is cut off the hand is destroyed as well. Entry nodes also can receive bleeding effects which will lead to a character bleeding out over time. Inner nodes aren't visible to the player (although this will change with the implementation of certain features in the future) and are connected to entry nodes. Inner nodes will be used to apply certain status effects to a character. Right now a character can be killed by destroying a vital organ (brain, lungs, ...) and blinded by destroying their eyes. This was a struggle to implement, but I finally managed to add flexible equipment slots which can also be defined via the body graph. This allows me to add different equipment slots for non human characters as well as removing equipment slots if the specific body part is torn off (TBD). 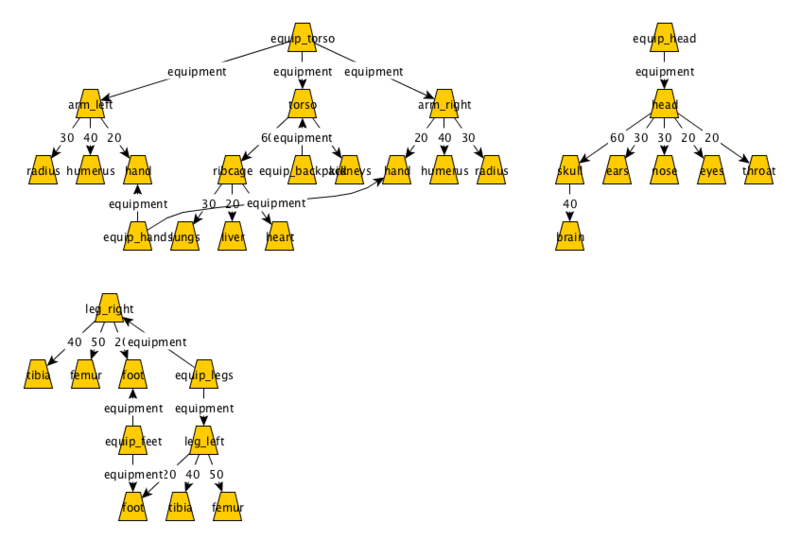 All in all the player only has to worry about the status of the entry nodes. With the addition of a medical system in future updates bleeding can be stopped and damaged body parts can be healed. Inner nodes / internal organs only act as a way to simulate certain status effects and handling critical hits. - Added new tiles "Gravel" and "Wooden Floor"
- Added new world object "Tree"
This should finally resolve the last few stubborn AI issues.